Getting a visa to India in Bangkok takes a little longer and is a bit more complicated than for most other Asian countries, but it’s not rocket science if you know where to look. It is also 100% not necessary to have a third party take care of the process, particularly Khao San agencies. Follow these steps, and you’ll be on your way to the subcontinent in no time. "As per the latest update from Indian Embassy Bangkok, any Non Thai National who does not have residency in Thailand cannot apply any kind of visa in Thailand. Until further notice." The good news is that 113 nationalities are now eligible for an "e-visa" that's valid for 30 days and can be picked up at any of 15 Indian airports once an online application has been approved. 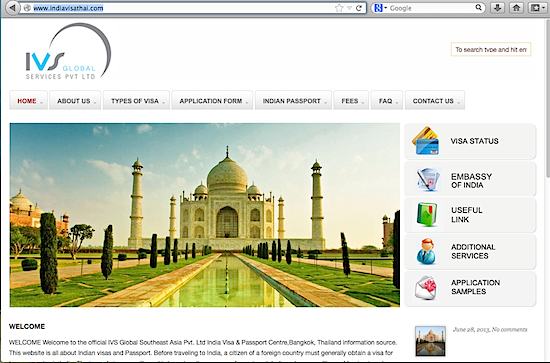 If interested, head to the official Indian e-Tourist Visa site. In Bangkok, the existing Indian visa process (explained below) remains valid for residents of Thailand who meet the new criteria. Any changes to the rules will be posted here as we become aware of them. The most important aspect of the Indian visa process to be aware of is that visa applications are only available online; if you show up at the India Visa Centre and ask to fill out an application by hand, you’ll be out of luck. Applications must be filled out online (see below for instructions), then downloaded, printed and brought to the Visa Centre in person. After a rather harrowing transition in mid 2013, the India Embassy in Bangkok has sorted out the visa application process and it now appears to be more streamlined than ever. 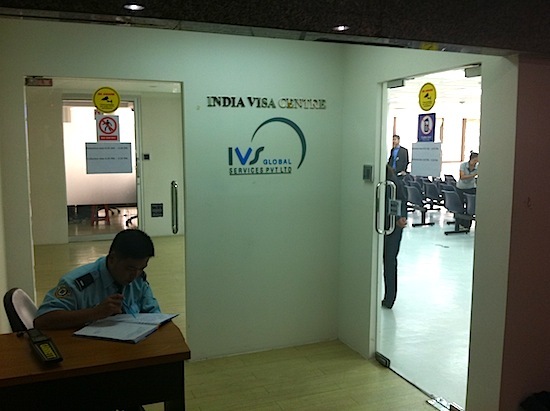 The updated embassy site now provides reliable information and working links to the India Visa Thailand page run by IVS Global (pictured below), which is the main site you’ll need throughout the visa process. While this post is focused on obtaining a tourist visa, the India Visa Thailand website also provides instructions for other types of visas. Note that it’s not necessary to visit the actual India Embassy on Sukhumvit Soi 23 at any time during the visa application process. This page is the starting point for your journey. To locate the necessary online application form on the India Visa Thailand website linked to above, click “Online Application” under “Application Form”, which will shoot you to this page. 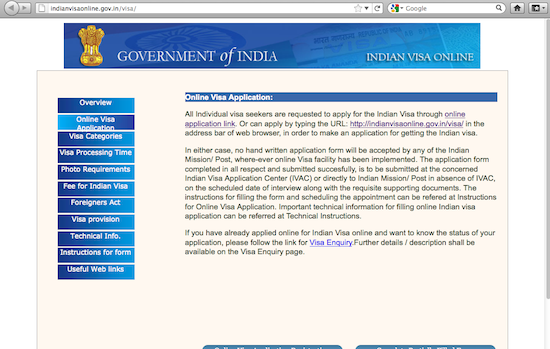 From there, click on the “Apply Online” icon at the bottom of the page, and you’ll then be whisked to the standardised Indian government visa page (pictured below) that all visa applicants from anywhere in the world must go through. However, there’s a problem with the “Online application link” on this page — it’s an “untrusted connection” according to our computers. 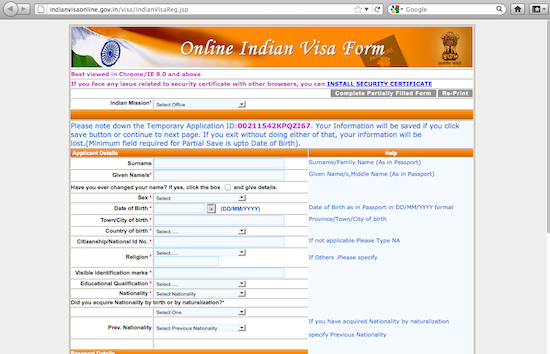 Rather than taking the risk, click “Online Visa Application” from the left sidebar, then the “online application” link. Once you reach the “Online Indian Visa Form” page pictured below, fill out the application, submit, download, print and keep your temporary application ID number for reference. If you get stuck, the IVS India Visa Thailand site offers advice for dealing with “frequent errors” while filling out the four-page online application form. With the finished, printed visa application in hand, head to the India Visa Centre (see directions below) along with your passport with at least six months validity, two 2X2 inch passport photos (any other size will be rejected), two photocopies of the photo/vital info page of your passport, two copies of your Thai visa page (if you have one) and latest entry stamp, the visa fee (Thai baht only) and, unless you’re a Thai citizen, a separate reference form that can be downloaded via a link found at the bottom of the “Online Application” page of the India Visa Thailand website. The reference form must be printed and filled out by hand, and more than one person has reported that it will only be accepted if filled out in black ink. According to the India Visa Thailand website, proof of travel into, and out of India, and proof of a hotel booking in India or invitation letter from India residents are also required. Some people have reported that actual air itineraries and hotel bookings are necessary while others claim they simply wrote in specific travel plans and accommodation arrangements in the online visa application form and were not asked to show further documentation. Others have reported success using, for example, print-outs of email responses regarding reservation inquiries from hostels, and the air itinerary that you'd see on a booking site right before you actually book the ticket. Applications must be dropped off at the India Visa Centre between 08:30 and 14:00 Monday through Friday, excluding Indian and Thai holidays, and pick-up is between 16:30 and 17:30. Processing time typically takes six working days for non-Thai citizens (three days if you are a Thai citizen), although it can apparently take up to eight working days without warning. It’s possible to track your visa application online by inputting your passport number and last name in the “Visa Status” section of the India Visa Thailand website. If you can’t make it to Bangkok in person, it’s possible to send a representative on your behalf; they must provide a copy of their ID card and fill out the “authority letter” form linked to in the “online application” page of the India Visa Thailand website. For most nationalities, a tourist visa gets you a six-month double entry stay, but the clock starts ticking from the day the visa is issued -- so if you depart five months after receiving the visa, you'll only get one month in India. An official in Bangkok told us that most nationalities are no longer required to stay outside of India for a minimum of two months after leaving the country. However, this requirement apparently stands for Chinese and most Middle Eastern nationalities. The visa fee depends on your nationality and varies widely; Australians pay 2,185 baht while British citizens have to shell out 4,485 baht. The final fees include a smattering of random extra charges. The India Visa Centre is located on the 22nd floor of 253 Asoke on Asoke Road (aka Sukhumvit 21), across the road and a tad north from Rutnin Eye Hospital (see map). If coming from Phetchaburi MRT subway station, take exit 2 out of the station, walk south for no more than 200 metres and 253 Asoke will be on the right, just after the canal bridge. If coming from Asok BTS skytrain station, take exit 3 out of the station, walk straight at the bottom of the stairs, take the immediate left onto Asoke Road and walk 1.2 kilometres until you reach 253 Asoke on the left. The building is marked by a large sign out front with the address and a smaller sign for the India Visa Centre. The Centre is easy to find, right next to the elevators on the 22nd floor.